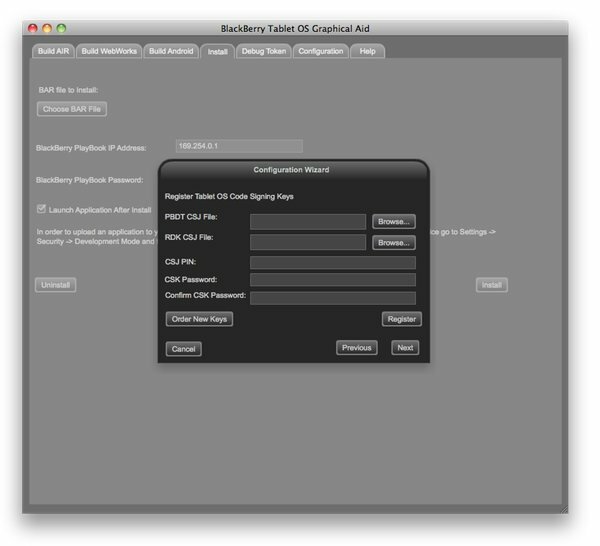 Since the release of PlayBook OS 2.0 we've been covering a lot of different ways to get Android apps onto your BlackBerry PlayBook. Most of the methods covered take into account that you may already have the Android .APK files converted to a BlackBerry PlayBook compatible .BAR file and go from there. Gathering up converted .BAR files and installing them is the easy part, but what if you want to convert your own Android files for use rather than downloading those already converted? There are already a few great guides in the CrackBerry forums but most of those are geared towards Windows users. 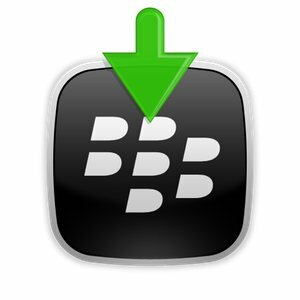 We will also cover Windows users in this guide, and those of you out there who use a Mac will find that this will be one of the easiest guides to follow to complete the task of converting your own Android .APK files to .BAR files, signing them and even installing them directly to your BlackBerry PlayBook for immediate use. Sound good? If so hit the break to get started. In order to get things rolling, you're going to need a few things. 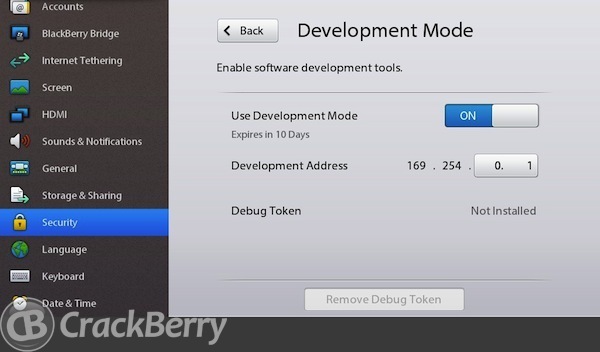 A few downloads from the BlackBerry Developers Jamzone site and one from the Android developers site and you'll be up and running. My personal suggestion would be to download these items to your desktop, so that you know exactly where they are -- you'll need to reference them later. Download The Android Command Line Tools - Don't let the name scare you, you won't really need to use command line. Download The Android SDK - Grab the version most compatible with your system. ie: Mac for Mac, Windows for Windows. Unzip it and go to the "Tools" folder where you will need to run the file named "Android" and grab the updates. 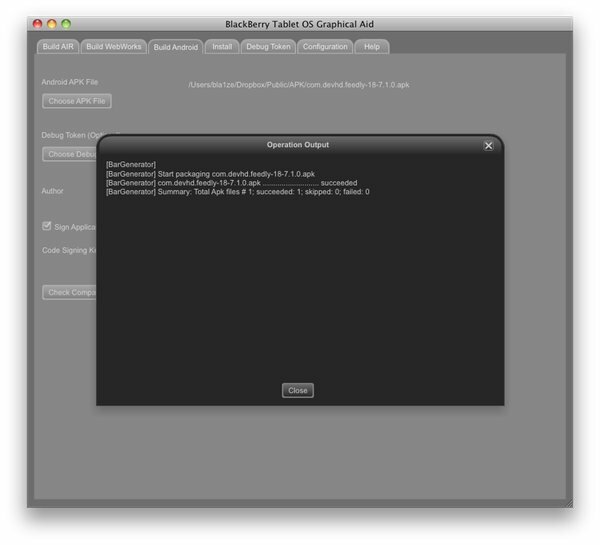 Download The BlackBerry Tablet OS Graphical Aid - This is the magic that makes it all happen. Make sure you grab the right version. ie: Mac for Mac, Windows for Windows. Unzip and install the file. With all your stuff now downloaded and installed, your code signing keys should have arrived in your email. If so, you're ready to get started on registering them and you're one step closer to being able to convert your own Android apps. 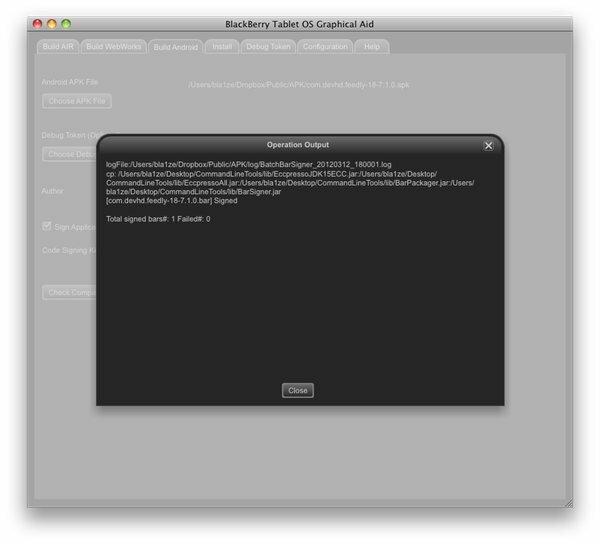 Now, go ahead and locate the BlackBerry Tablet OS Graphical Aid app we installed and open it up. 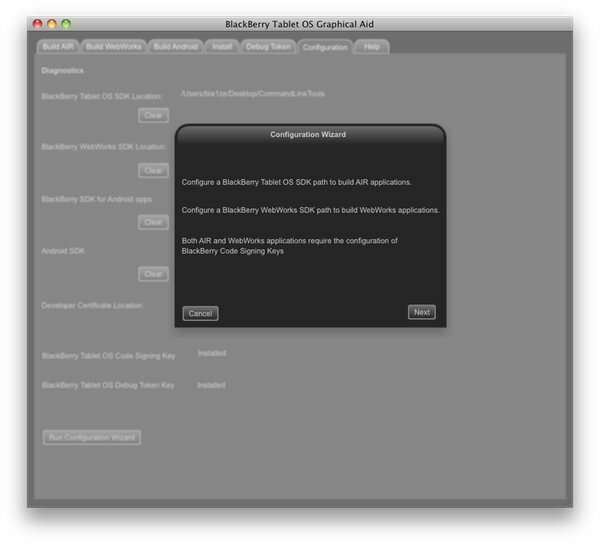 When open, you'll want to go to the "Configuration" tab as shown above to get started. When the window pops up, just go ahead and click on next. 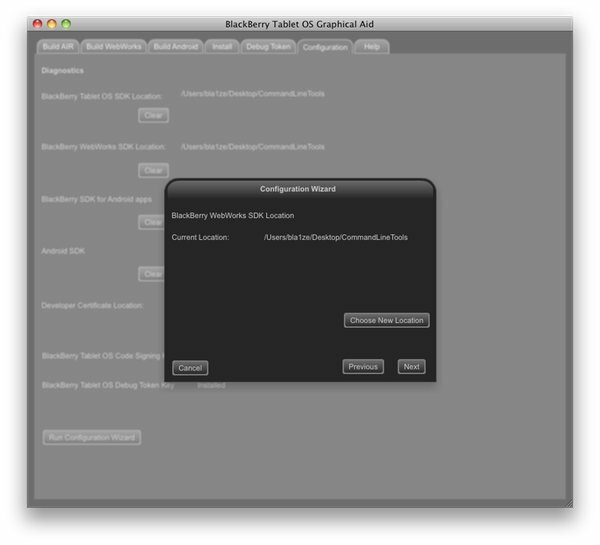 You're then presented with the option to browse to various locations of the things you downloaded, the first being the BlackBerry WebWorks SDK location. For all of these, we're going to point them to the "Command Line Tools" folder you downloaded and unzipped. Once you get to the "Android SDK" option, make sure you change it to point to where you stored that. The next item you will come to is the "Developer Certificate". At this point -- you don't have one. 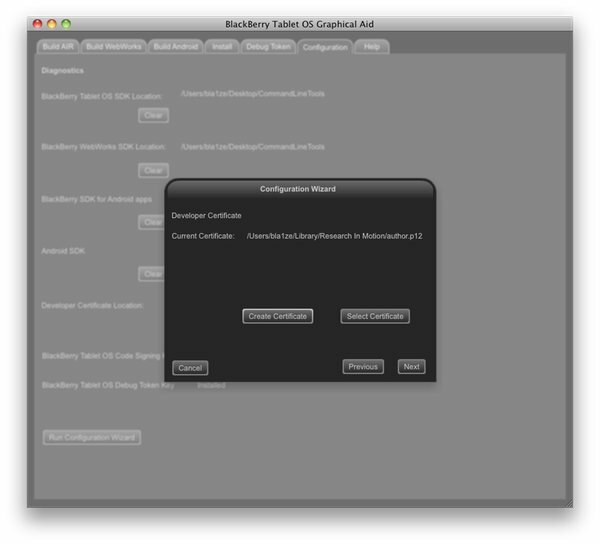 As such, you'll need to create one, so you can go ahead and click on "Create Certificate. Assuming you adjusted all the files accordingly and have the paths laid out, it will process and fill in with your "author.p12" developer certificate. Once you have that, you may move on to the next step. The next section is where you will need to point to your code signing keys and remember the PIN that you registered with. As shown above, you can browse to the individual files and fill in those slots. Your "CSJ PIN" is the PIN you created, for password -- you must choose a password and then repeat it for confirmation. If you're a developer, then make it a real password. However, if you're just doing this for the sake of it and so that you may make your own .BAR files from Android .APKs, just make it the same as your PIN. Personal suggestion of course, in the end -- do as you wish. As long as it conforms to the requirements you should be able to move to the next step which is to simply click on "Register". From there, you will get a processing screen and once processed, an email will hit your registered email confirming that you have successfully registered your code signing keys. If all of that went well, then you are ready to move on to the next step. You can go ahead and click on the "Build Android" tab as shown above. Assuming you have some Android .APK files you wish to convert, you will see where you can load those files -- "Choose APK File". Once you have one loaded, you will need to fill out some of the options, such as whether or not you wish to sign the .APK, your developer name and your developer certificate password (this is the password from the set up process). In this case, you'll want to sign them and ensure all the spots are filled in with the correct information. You can also check compatibility from here as well. As we know -- not all Android apps will work. Some that say they won't, but will work with less functionality. Entirely up to you if you wish to check compatibility, just keep in mind, not all files will work. That's just how it is and some will produce error messages. Once all info is loaded, you can click on "Build". After clicking on "Build", you'll see it processing and once completed you should see something similar to the above image. This confirms whether or not the signing and building of the .BAR file was successful. You can see at the bottom of the text there, it states one .BAR file was signed and it was successful. You now have a signed .BAR file ready to be loaded on your BlackBerry PlayBook. If you're unsure of where, exactly that .BAR file went -- you should be able to find it in the same folder as the .APK you loaded. 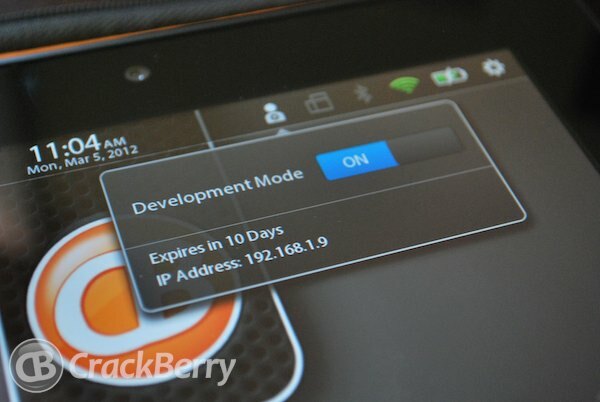 Put your BlackBerry PlayBook into Developer Mode by going to Settings > Security Settings and note the IP address of your PlayBook. You'll also be required to enter a password here if you don't have one already. Don't forget your password!! 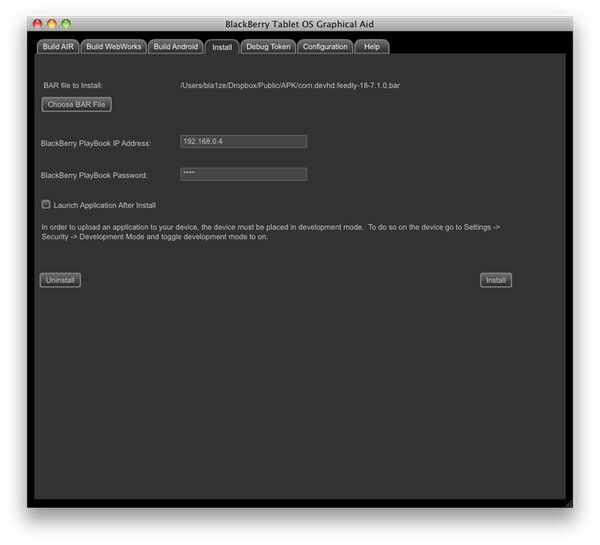 With your PlayBook IP noted and your PlayBook password filled in, you're now ready to install the .BAR file you created. Assuming you have your BlackBerry PlayBook plugged into your PC or Mac, you can now proceed and click on the "Install" button. Once you click on the "Install" button, your chosen .BAR file will begin installing. 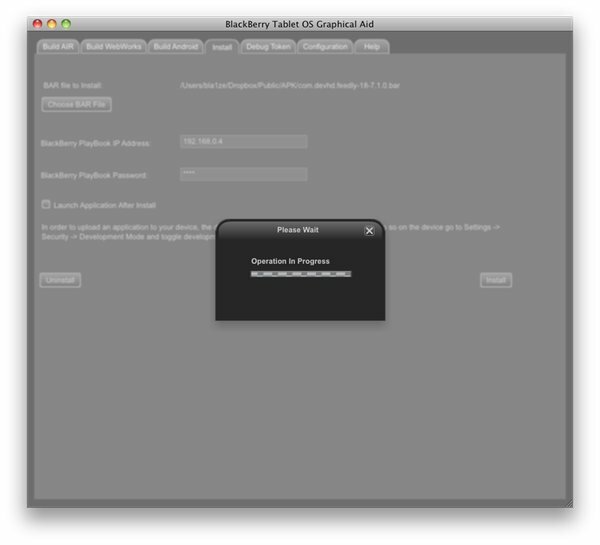 It will sit there for a few moments depending on how large the application you are sending to your BlackBerry PlayBook is. If it's larger, it will take longer -- just be patient as it will provide confirmation once the process has been completed. With your chosen .BAR file now installed, you should see similar to above on your screen. This is the confirmation that your app was installed successfully or not. If not, you'll have to retrace your steps and see where you went wrong but if you followed this guide you really should be seeing a successful confirmation. 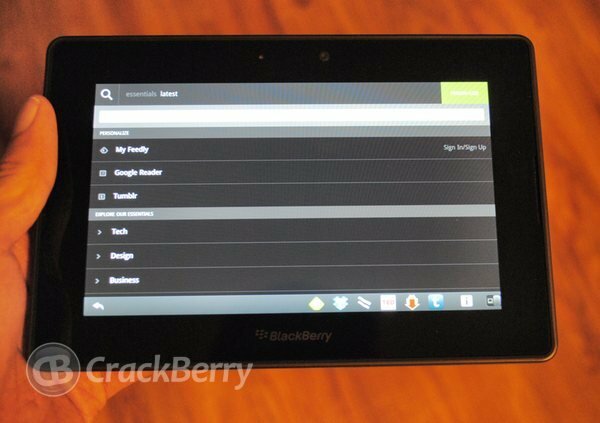 You can now close everything down and check out the app on your BlackBerry PlayBook. There you have it. 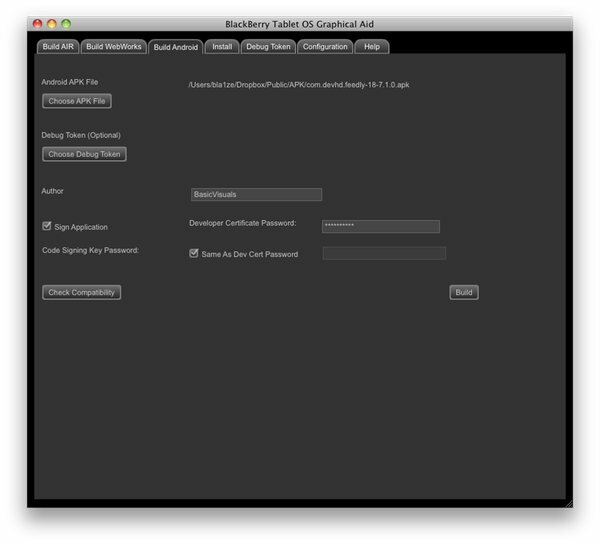 A complete, no command line process to convert Android .APK files to BlackBerry .BAR files. Just remember folks, you shouldn't be submitting these apps to BlackBerry App World or anything along those lines, that's not very developer friendly. 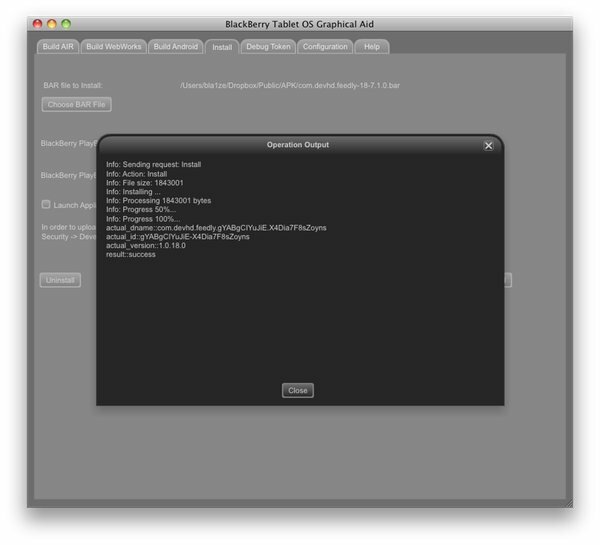 But if you have free, working converted .BAR files -- by all means drop into the CrackBerry forums and share them.